MARSEILLE, Sporting Alert – A brace on either side of 45 minute by Antoine Griezmann lifted France to a 2-0 win over Germany in their European Championship semifinal at the Stade Velodrome. Griezmann put the host nation ahead just before the halftime break from the penalty spot before the Atletico Madrid forward doubled his tally in the 72nd minute to send France into Sunday’s final against Cristiano Ronaldo and Portugal. 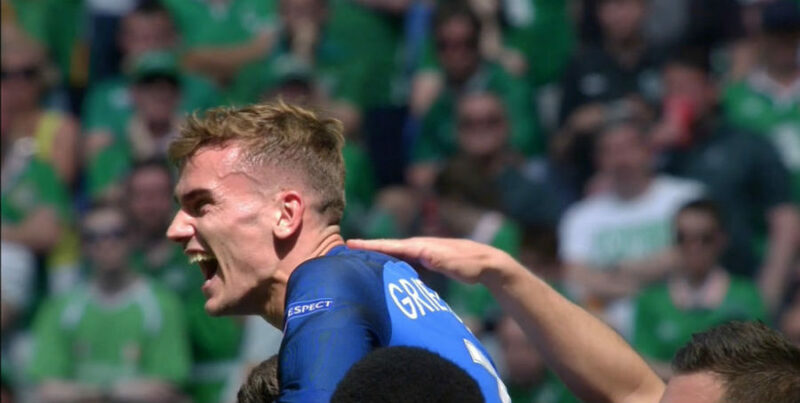 Griezmann, who scored his 5th and 6th goals at the tournament, remain’s Euro 2016 leading scorer, as he scored twice as many as any other player. World Cup champions Germany was the better in the first half, but failed to take advantage of having the upper hand and paid the price for some defensive blunders. France led Germany 1-0 at halftime in their European Championship semifinal, despite seeing less of the action in the opening 45 minutes at the Stade Velodrome. The lone goal of the contest came just before the break when forward Antoine Griezmann scored from the penalty spot. Griezmann, the leading Frenchman at Euro 2016, comfortably put the ball away from Germany’s goalkeeper Manuel Neuer, who went left as he watch the taker put it right. The penalty kicked was conceded by Germany captain and Manchester United experienced midfielder Bastian Schweinsteiger after he handled the ball inside the area, while going up for a header. Before the penalty kick and opening five minutes of the contest, however, it was all Germany, which will feel a bit unlucky to have conceded a goal in the first half. Bayern Munich forward Thomas Mueller and Liverpool midfielder Emre Can both had good looks to score in the first half, but fell short. France striker Olivier Giroud also had a chance to score for the host nation, but he lacks the speed needed to get away from his marker, following a fast breakaway, which was cut out by a well-timed sliding tackle from Benedikt Hoewedes as the Arsenal man attempted to take a shot. Germany: Manuel Neuer, Jonas Hector, Jerome Boateng, Benedikt Hoewedes, Joshua Kimmich, Emre Can, Julian Draxler, Toni Kroos, Mesut Ozil, Bastian Schweinsteiger, Thomas Mueller.